Rising property values and increased demand led to an all-time high in sales dollar volume in 2018 as shrinking affordability spread across Central Texas. 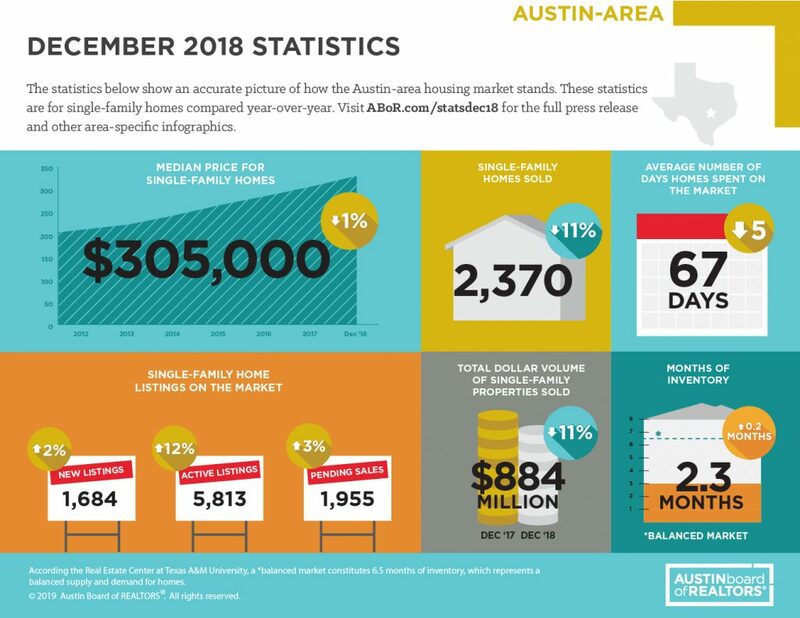 In the Austin-Round Rock MSA, one of the fastest-growing regions in the nation, the median price for single-family homes increased annually by 3.6 percent to $310,400. Sales increased annually by 2.1 percent to 30,713 sales. In December, the median home price decreased 0.8 percent year over year to $305,000, and sales decreased 11.1 percent year over year to 2,370 sales. New listings for the five-county MSA increased annually by 0.8 percent to 38,870 listings in 2018. During the same period, active listings increased 2.5 percent to 6,559 listings and pending sales increased 1.9 percent to 30,805 pending sales. Housing inventory increased in December by 0.2 months to 2.3 months of inventory in the five-county MSA.